Miss Elaine Nightgowns - if attractive, well made, and affordable night gowns are on your agenda, this popular family-run ladies sleepwear brand is definitely worth a look. Designed for women who prefer classic and comfortable sleepwear that's affordable, Miss Elaine is a tried and true intimate apparel favorite that caters to virtually every size, shape, and silhouette. From pretty floral cotton knit nightgowns to smooth and silky gowns, this lingerie manufacturer is a great option for today's busy woman on the go. Add up Miss Elaine’s easy wearing fabrics, like gorgeous nylons and tricots, crisp and fresh cotton nightgowns, and sensational satin nightgowns, and you’ve got a whole lot of options to choose from. Many intimate apparel brands have a more limited range when it comes to sleepwear materials and styles but Miss Elaine offers beautiful nightwear for a range of tastes and occasions. From lightweight short nighties in pretty printed knits to luxurious long nightgowns in blended waffle cottons, styles are designed for maximum movement and wearability. Our top pick for cold winter nights - brushed back satin nightgowns with two layers of ultra softness that don’t sacrifice style or sophistication. A great advantage of Miss Elaine sleepwear is the range of sizes. From XS, S, M, L to XL and plus sizes 1X, 2X and 3X, there are nightgowns and popular sleepwear styles to fit virtually shape and size. 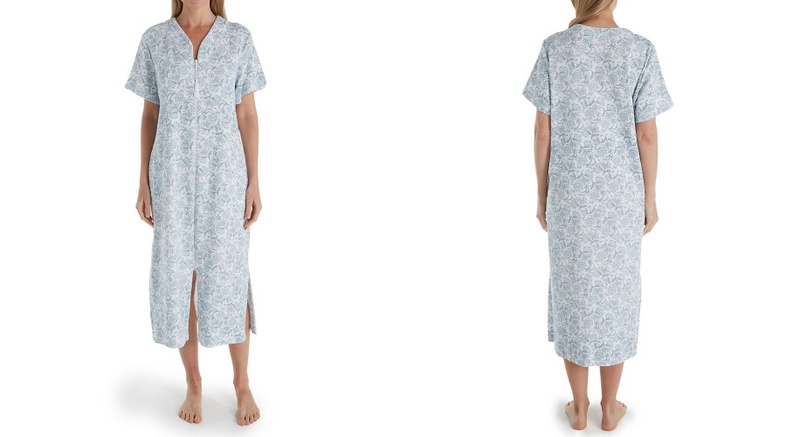 What makes this popular ladies sleepwear such a hit with so many devoted fans? Miss Elaine’s style doesn’t come from flashy styles, gimmicky designs, and wild trims. Instead, they embrace the smaller details that make up so many of their beautiful nightgowns, pajamas, and women’s robes. Subtle hints of smocking across the chest, a pin tucked bodice, a finely scalloped edge, or a simple ribbon trim are just a few examples of Miss Elaine’s restrained elegance that gives each perfect style the delicate details that make women feel special. One of the most popular nightgowns currently offered by Miss Elaine is the pretty Liquid Knit Gown. 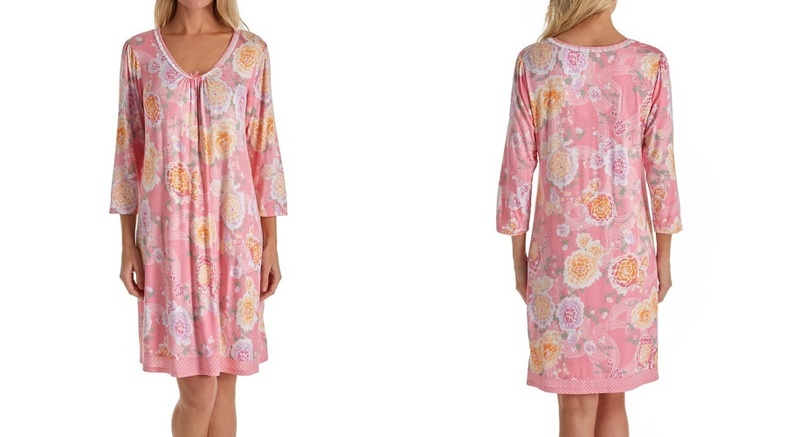 Silky soft, stretchy, and comfortable, this delightful lightweight nightgown is available in both cap and long sleeve styles that make it a no fuss favorite. When designing their simple and sophisticated sleepwear, this womens sleepwear manufacturer follows the old adage “If it ain’t broke, don’t fix it”. Avoiding gaudy, cutting edge, or and trendy styles, Miss Elaine nightgowns offer classic designs in a traditional range of styles, with a pretty and feminine color palette that has become their signature niche. Devotees of this sleepwear brand know exactly what they’re getting with Miss Elaine nighties, and it’s the consistency, comfort, and quality that they return to again and again. With Miss Elaine sleepwear, it's easy to love the elegance, reliability and classic design aesthetic that never goes out of style. 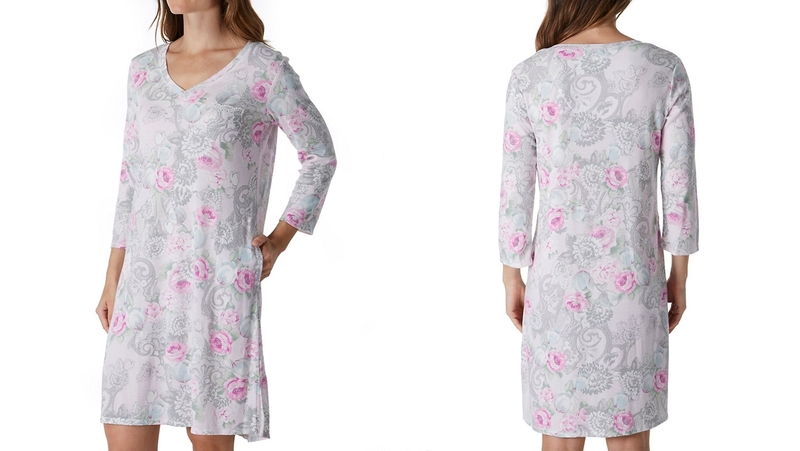 When it comes to looking great and feeling comfortable, Miss Elaine sleepwear offers the perfect balance of easy pullover style gowns in feminine prints that can be mixed and matched with intimate apparel basics you already have in your collection. From attractive scoop necklines trimmed with delicate lace and tiny bows to button fronts, long sleeves, and handy hidden side pockets, these fashionable favorites are designed for maximum comfort and easy wearability that can be enjoyed year round.